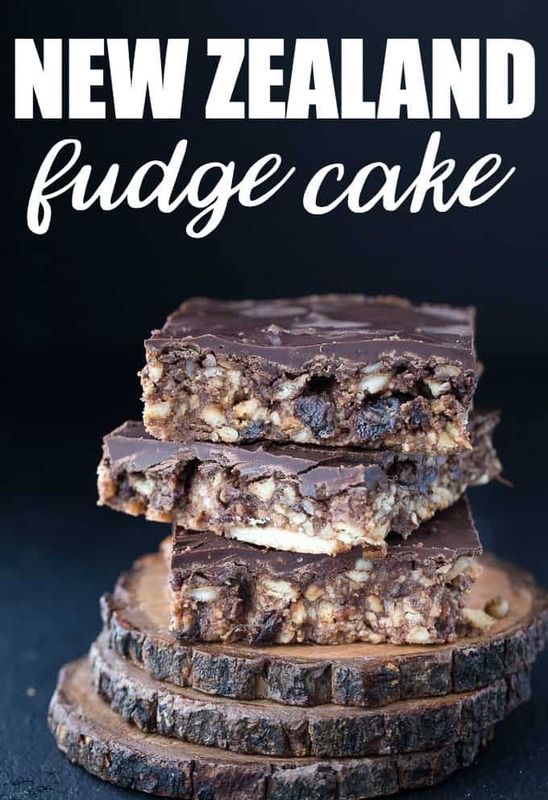 New Zealand Fudge Cake is a no-bake sweet treat that the whole family can enjoy. You might have enjoyed this fudge cake growing up, and if so you know how it is one fantastic treat to nibble on! Social Tea cookies, nuts, raisins, with sweet chocolate all formed into fudge cake. The perfect snack to take on a road trip, as a treat for your mid-day slump, or a midnight snack. There is no wrong time to enjoy this tasty dessert. Nothing beats a no-bake dessert, am I right? The hardest part I would say is waiting for the New Zealand Fudge Cake to set up in the freezer. I am the type of person that has to hold back from diving into the hot batter. I love me some chocolate, and this is the perfect crispy and sweet treat that my sugar cravings yearn for. 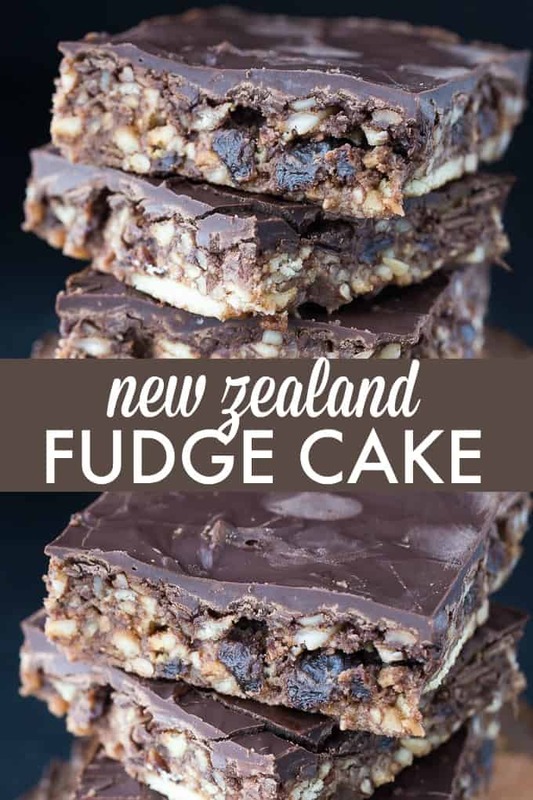 Some know this New Zealand Fudge Cake by another name. It is also referenced as Biscuit fudge. However you choose to call this, it is tasty that is something to agree on. New Zealand Fudge Cake is a biscuit fudge recipe that is a tried and true. You have the slightly crispy texture from the broken up Tea cookies inside, and it helps tame down the rich chocolate flavor. Some even add in some chopped dried walnuts, cranberries, candied ginger, etc. All will add even more dimensions to the recipe. If you can’t find the same cookie I used, you can always look for variances. A plain and crisp biscuit style cookie will do. You can use macaroon, shortbread, or a sugar biscuit. Just reach for a biscuit or cookie that is a bit harder in texture, so it holds up and gives you a light crispy feel when you bite in. Depending on what part of the world you live in will depend on what type of cookie/biscuit you can find. Just aim for a light and mild flavor that is crisp, not soft. I grab a gallon sealable bag and toss in the biscuits/cookies. Then I seal it up and take a rolling pin and roll it over the biscuits with a slight amount of pressure. It crushes them up nicely while still leaving them broken up into larger pieces. You don’t want to crush it too fine, or you won’t have that slight crispy texture within the fudge. Give this recipe a try and let me know how you like it. You will find it can quickly become a family favorite. I love to make this around Easter and in the spring. It is a fun treat for my daughter and me to nibble on. A simple, no-bake dessert made with raisins, nuts, cookies and lots of chocolate! Put butter, sugar, eggs & cocoa in saucepan. Stir until butter melts. Add rest of ingredients except chocolate chips. Pour into lightly greased 8″ square pan. Frost with melted chocolate chips. Cool and cut into squares. Freezes well! This looks great and so different. Easy to do, too. Thanks for the tip that it freezes well. Do the cookies get crumbled or just go in whole? Laid out as a bottom crust? Sounds very good, easy to make. But I’m puzzled about the cookies. This looks so amazing Stacie! I`m pinning it, because I have to try it! These look amazing and delicious!!! Oh my gosH this looks delicious. What an interesting recipe! YUM! 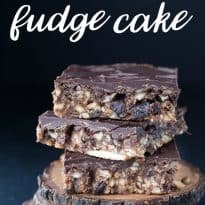 Great recipe…looks so decadent and easy. Thanks for sharing at DI&DI.